SayWhatNews: Good morning Ladies of SKYY. Thanks for sitting down and speaking with SayWhatNews. Tell us who are the Ladies of SKYY. 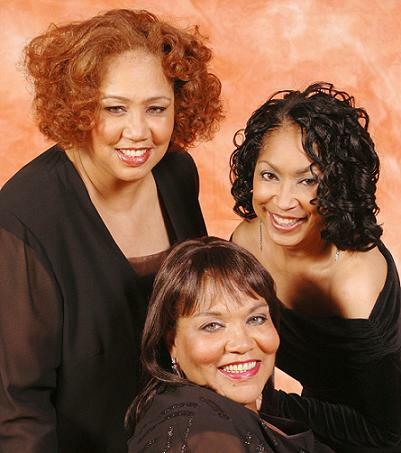 SayWhatNews: You ladies are a trio of singing sisters. When did you realize that you had the gift of song and were able to harmonize with each other? SKYY: BOTH OUR MOM AND OUR DAD HAD BEAUTIFUL VOICES, AND ALWAYS SANG SONGS AROUND THE HOUSE. MOMMY WAS A FAN OF PEARL BAILEY, AND DAD A FAN OF ARTHUR PRYSOCK. MY DAD ALWAYS PLAYED MUSIC IN THE HOUSE AND WE WERE ALWAYS SINGING. WE PROBABLY DIDN’T REALIZE THAT WE COULD HARMONIZE UNTIL WE ATTENDED HIGH SCHOOL AND STARTED TO RECEIVE FORMAL TRAINING. SayWhatNews: So what type professional training helped tune your craft? SKYY: OUR PROFESSIONAL TRAINING WAS RECEIVED FROM OUR CHORAL TEACHER AT FDR HIGH SCHOOL, IN BROOKLYN, NEW YORK, MRS. ANTOINETTE LIND. SHE LED THE MIXED AND GIRLS CHORUSES. SHE DEMANDED EXCELLENCE AND TAUGHT US HOW TO USE OUR VOICES PROFESSIONALLY. SHE TAUGHT US HOW TO BREATHE PROPERLY AND HOW TO PRONOUNCE WORDS PROPERLY. WE LEARNED HOW TO SING ALL TYPES OF MUSIC - POPULAR, JAZZ, AND CLASSICAL (IN GERMAN AND ITALIAN). EVERYTHING WE KNOW ABOUT USING OUR VOICES CORRECTLY, WE LEARNED FROM HER. SayWhatNews: Fast forward to 1976. Tell us how the group SKYY became to be? SKYY: THERE WERE ORIGINALLY FOUR WOMEN IN OUR GROUP, AND WE WERE KNOWN AS THE SOUNDS OF SOUL. WE MET RANDY MULLER AT THE MISS BLACK AMERICA NEW YORK STATE PAGEANT IN 1971 AND STARTED WORKING AS AN OPENING ACT FOR BRASS CONSTRUCTION. WHEN THEY GOT THEIR FIRST RECORD DEAL IT NO LONGER MADE SENSE FOR US TO SING WITH THEM, SO RANDY INTRODUCED US TO SOLOMON ROBERTS, JR. SOLOMON ALREADY WORKED WITH ANIBAL (BOOCHE) SIERRA (GUITARIST), AND DECIDED TO PUT TOGETHER A DIFFERENT KIND OF BAND. MOST BANDS COMING OUT OF BROOKLYN AT THE TIME WERE ALL MALE, BUT WE WERE UNIQUE BECAUSE WE HAD THE BAND, COUPLED WITH THE SOUND OF FOUR STRONG FEMALES VOICES. EVENTUALLY THE FOURTH FEMALE DECIDED TO PURSUE RAISING A FAMILY, AND SO THE DUNNING SISTERS WERE LEFT WITH SOLOMON AND ANIBAL SIERRA. WE PERFORMED AT LOCAL COMMUNITY FUNCTIONS, BUT WHEN WE STARTED TO GET SERIOUS ABOUT RECORDING AND GOING PROFESSIONAL, GERALD LEBON (BASS) AND TOMMY MCCONNELL (DRUMS) JOINED THE BAND. WHEN WE WERE READY TO RECORD OUR FIRST ALBUM, LARRY GREENBERG (KEYBOARDS) JOINED THE BAND TO FORM WHAT ULTIMATELY BECAME SKYY. SayWhatNews: How did you come up with the name SKYY and does it have a meaning? SKYY: WHEN WE CAME OUT IN THE 70’S, THE SPACE THEME WAS REALLY BIG IN MOVIES AND TELEVISION, AND IT HAD AN INFLUENCE ON WHY WE CHOSE THE NAME. WE WANTED TO SELECT A NAME THAT REFLECTED DIFFERENT MOODS, AND THE NAME SKYY JUST MADE SENSE. WE ADDED THE EXTRA Y TO MAKE IT MORE UNIQUE. SayWhatNews: In 1979 SKYY was signed to its first record label Salsoul Records. How was the group discovered? SKYY: WELL, RANDY MULLER AND SOLOMON ROBERTS RECORDED ALL OF THE TRACKS FOR THE FIRST ALBUM AND SHOPPED IT AROUND TO DIFFERENT RECORD LABELS. SOME OF THE LABELS WANTED JUST THE GIRLS, SOME WANTED JUST THE BAND, BUT SALSOUL LISTENED TO THE MUSIC AND REALIZED THAT THIS WAS A UNIQUE AND DIFFERENT SOUND. WE COMBINED FUNKY GUITAR LICKS AND BASS LINES WITH THE SMOOTH SOUND OF THE LADIES SINGING. THEY SAW SOMETHING IN US THAT NO OTHER LABEL DID, AND THEY BROUGHT US ON BOARD WITH THEIR RECORD LABEL. SayWhatNews: Over the years SKYY has had several hit records like “High”, “Here to You” and “Skyyzoo”, but the one song that became the groups signature song was “Call Me”. What was the inspiration for writing this smash hit? SKYY: RANDY MULLER WAS THE WRITER OF THAT SONG. WHEN I FIRST HEARD IT, I WAS A BIT PENSIVE ABOUT SINGING IT BECAUSE, AFTER ALL, IT IS JUST BLATANTLY STEALING A FRIEND’S MAN, WHICH I WOULD NEVER CONDONE. BUT IN LISTENING TO IT, THE SONG HAD A ‘SLICE OF LIFE’ CONTENT, AND A LIGHT-HEARTED FEEL TO IT, AND I JUST WENT WITH IT. I CAN’T SAY WHAT WAS ON RANDY’S MIND WHEN HE WROTE IT, BUT IT WENT ON TO BECOME OUR ALL TIME NUMBER ONE HIT...MOST PEOPLE TOOK THE CONTENT WITH A GRAIN OF SALT AND WERE NOT TOO UPSET WITH THE CONCEPT. SayWhatNews: Well, its evident that fans weren’t too upset with the content because “Call Me” was such a huge hit that it went Gold and the album “SKYYLINE” went Gold. So how did the group feel about its great success? SKYY: WE WERE ABSOLUTELY TAKEN BY SURPRISE. WE HAD RECORDED FOUR ALBUMS BEFORE THAT, AND HAD NOT YET ACHIEVED THAT KIND OF SUCCESS. I REMEMBER THAT I FIRST HEARD IT ON THE RADIO SITTING IN MY BLACK AND RED CHEVY IMPALA, AND MY SISTERS AND I WERE SCREAMING OUT THE WINDOW, “THAT’S US”! PEOPLE, OF COURSE, THOUGHT WE WERE CRAZY! THE SONG WAS SO SUCCESSFUL THAT SOUL TRAIN CALLED US TO BE ON THE SHOW SHORTLY AFTER THE SONG WAS RELEASED. APPEARING ON SOUL TRAIN WAS THE MARKER FOR EVERY GROUP’S SUCCESS, AND TO HAVE BEEN CALLED BY THEM TO COME ON THE SHOW WAS A GREAT HONOR. THE SUCCESS OF THAT SONG AND THAT ALBUM HAPPENED SO QUICKLY, I DON’T THINK OUR FEET TOUCHED THE GROUND UNTIL AFTER THE BIG TOUR WITH KOOL & THE GANG ALMOST 14 MONTHS LATER. SayWhatNews: Now that had to be a great tour with Kool & The Gang. Now, in 1985 Salsoul Records ended its operation and SKYY then moved to Capital Records in 1986. How did Capital Records end up being the groups new home? SKYY: I AM REALLY NOT SURE HOW THAT HAPPENED. WE WERE SO DISAPPOINTED BY THE LOSS OF OUR SALSOUL FAMILY, AND SO VERY ANXIOUS TO FIND A HOME SO THAT WE COULD KEEP THE MOMENTUM GOING. I BELIEVE RANDY MAY HAVE HAD SOME CONNECTIONS THAT GOT US THROUGH THE CAPITOL DOOR. SayWhatNews: The group was part of the Capital Records family for a brief time. Why did SKYY leave the label? SKYY: I DON’T THINK WE WERE ALL ON THE SAME PAGE STYLISTICALLY, BUT AS OUR PRODUCERS, RANDY AND SOLOMON WERE MOSTLY IN CHARGE OF THOSE TYPES OF DECISIONS. SayWhatNews: In 1989 SKYY re-emerged at Atlantic Records and recorded two albums, “Start of a Romance” and “Nearer to You”. Now even with continued success with 2 singles “Start of a Romance” and “Real Love” both reaching the #1 spot on Billboards R&B Singles Chart, the group left another record label. What happened? SKYY: BY THAT TIME, THE AUDIENCES MUSICAL PREFERENCES STARTED TO CHANGE. HIP HOP AND RAP MUSIC BEGAN TO EMERGE, AND A NEW GENERATION OF LISTENERS BEGAN TO PURCHASE RECORDS. THE BANDS NOW STARTED TO MOVE OVER FOR THE 3 MAN RAP GROUPS AND THE 4 MAN VOCAL HARMONY GROUPS. WE HAD A 13 YEAR RUN IN THE INDUSTRY, AND IT WAS JUST NOW TIME FOR THE NEXT GENERATION OF FOLKS TO TAKE OVER. SayWhatNews: Now, with image being the driving force of the music industry did the ladies of SKYY ever have to deal with image issues with the record labels? If so, what happened and how did you handle it? SKYY: WE NEVER HAD AN IMAGE PROBLEM, BECAUSE WE DID NOT BECOME SOME OTHER CHARACTER ON STAGE. WE REMAINED TRUE TO OURSELVES. WE ALWAYS PORTRAYED OURSELVES AS THE DOWN-TO-EARTH, BROOKLYN GIRLS THAT WE REALLY WERE. IN THE BEGINNING, THE SPACE THEME WAS PREVALENT, AND SO OUR COSTUMES REFLECTED THAT. AS TIME MOVED ON, WE BROUGHT IN STYLISTS TO GIVE US A MORE MODERN, APPROPRIATE IMAGE. HOWEVER, DURING OUR ERA OF MUSIC, THERE WAS NO NEED TO BE HALF-NAKED IN THE VIDEOS AND ON STAGE, BECAUSE OUR MUSIC SPOKE FOR AND SOLD OUR RECORDS, NOT OUR BODIES. WE ALWAYS MAINTAINED RESPECT FOR OURSELVES, AND REPRESENTED OUR UPBRINGING IN A RESPECTFUL WAY! SayWhatNews: Exactly, real music lovers want real talent and not just some half dressed image on stage dancing. Thinking back on your career, is their any artists or producers you would have loved to have worked with? SKYY: IT’S FUNNY, BUT I HAVE TO GIVE CREDIT TO SOLOMON, RANDY AND TO TOM MCCONNEL, WHO WROTE AND PRODUCED OUR MUSIC. THEIR MUSICAL STYLE IS WHAT GAVE US OUR SIGNATURE SOUND, AND I DON’T KNOW IF WE WOULD HAVE ACHIEVED WHAT WE DID IF ANYONE ELSE WOULD HAVE WRITTEN OR PRODUCED OUR MUSIC. I MUST SAY THOUGH, THAT SINCE WE HAVE BEEN PERFORMING AS LADIES OF SKYY, WE HAVE HAD THE OPPORTUNITY TO WORK WITH MANY ARTISTS THAT WE WERE BIG FANS OF. RECENTLY, WE HAVE WORKED WITH GLENN JONES, HOWARD HEWITT, AND THE WHISPERS, WHICH HAS BEEN THE BIGGEST THRILL OF OUR RECENT MUSICAL CAREER. SayWhatNews: With the high-demand of “Old School” music from the fans, the Ladies of SKYY decided to come back and tour around the world. So, why did you decide to give touring a rest in 1991 when you were entertaining fans all over: in Germany, Italy, Holland, Japan, Africa and in the Bahamas? SKYY: WHEN OUR RECORD DEAL WITH ATLANTIC ENDED, WE WERE ALL VERY DISAPPOINTED. WE FELT THAT WE HAD A LITTLE MORE MUSIC IN US, BUT, AGAIN, THE STYLE OF MUSIC THAT WAS POPULAR BEGAN TO CHANGE. WE COULD NOT SELL OUT OUR STYLE AND TRY TO SING MUSIC OTHER THAN WHAT WE HAD ALWAYS BEEN DOING. SO, WHEN THE DEAL WITH ATLANTIC ENDED, WE JUST DECIDED TO GIVE IT A REST. WE HAD SPENT 13 YEARS OF OUR LIVES ENGULFED IN THE MUSIC INDUSTRY, AND MISSED OUT ON A LOT OF FAMILY LIFE. MY SISTERS’ TWO CHILDREN WERE STAYING WITH OUR PARENTS, AND THEY DECIDED TO BRING THEIR CHILDREN HOME TO RAISE THEM THEMSELVES. THE REST OF US WENT ON THE DEVELOP OUR FAMILY LIVES IN A WAY THAT WE HAD MISSED OUT ON FOR SO MANY YEARS. IT WAS A PAINFUL DECISION AT FIRST, BUT I THINK WE ALL WILL AGREE THAT WE MISSED OUT ON SEEING OUR CHILDREN GROW UP, AND SPENDING QUALITY TIMES WITH OUR HUSBANDS AND WIVES! SayWhatNews: 25 years later the hit song “Call Me” continues to be a favorite on the Old School R&B radio and even was added to the movie soundtrack for the hit film Beauty Shop starring Queen Latifah. Why do you believe the song has transcended time and remained a fan favorite? SKYY: AGAIN, IT TELLS THE STORY OF A SLICE OF REAL LIFE. IF A PERSON HAS NOT GONE THROUGH SUCH A SCENARIO, THEY MOST CERTAINLY KNOW SOMEONE WHO HAS. WHEN A SONG TELLS A GOOD STORY, IT IS MEMORABLE, AND CALL ME REALLY DIDN’T MEAN ANY HARM TO ANYONE...IT IS JUST TELLING IT LIKE IT IS. SayWhatNews: In 2007 the Ladies of SKYY attempted to beat the Guinness World Record-TM for the “largest Kazoo ensemble” at the Apollo Theater playing to your song “Skyyzoo”. Why did you guys decide to do this and did you beat the record? SKYY: WE DECIDED TO DO IT BECAUSE WE THOUGHT IT WOULD BE FUN! THE SONG SKYZOO IS A REAL CROWD PLEASER. PLAYING THE KAZOO DOESN’T TAKE ANY SPECIAL SKILL OTHER THAN BEING ABLE TO HUM. IT IS SUCH AN EASY INSTRUMENT TO PLAY, ANYONE CAN PLAY IT. SO WE DECIDED THAT SINCE WE WOULD BE PERFORMING TO A LARGE GROUP AT THE HARLEM SUMMERSTAGE CONCERT SERIES SPONSORED BY THE APOLLO THEATER, WE SHOULD TAKE A SHOT AT TRYING TO CREATE THE LARGEST KAZOO ENSEMBLE. WE PROBABLY WOULD HAVE SUCCEEDED IF GUINNESS(TM) HAD NOT POSTED A NEW RECORD THE WEEK BEFORE OUR RECORD ATTEMPT. WE WERE TRYING TO BEAT 2,400, AND SOMEONE POSTED A RECORD OF 2,700. WE DID NOT SUCCEED, BUT WE, AND THE PEOPLE OF THE GREAT COMMUNITY OF HARLEM, SURE HAD A LOT OF FUN TRYING!!! SayWhatNews: Tell us about Lady SKYY Productions and its mission. LADYSKYY PRODUCTIONS IS MY PERSONAL OPERATING COMPANY. ITS PURPOSE IS TO ADMINISTER ALL THE BUSINESS AFFAIRS OF THE LADIES OF SKYY, BUT IT ALSO FUNCTIONS AS A PROFESSIONAL COMPANY FOR ANY BUSINESS ENDEAVORS THAT I MAY UNDERTAKE. I HAVE PRODUCED SOME OPEN MIC SHOWCASES, CRAB FEASTS, AND SKI TRIPS, AND HAVE ASSISTED MY HUSBAND, AUSTIN, IN THE PRODUCTION OF FASHION SHOWS. I ALSO WORK AS A MISTRESS OF CEREMONIES AT RECITALS AND AT WEDDINGS, AND PERFORM SOLO FOR VARIOUS EVENTS ALSO. SayWhatNews: What’s next in the future for the Ladies of SKYY?